Each Tile has a cork back and hanger. Great as a coaster, trivet or wall hanging. These tiles look great in a kitchen, bath, office, or even a child's room. If desired you can remove the backing and grout the tiles into a wall. This also applies to our 2x2 magnet tiles. Just remove the magnet, if desired, and use like regular decorative tiles. Great Gift Item! Our tiles come in a variety of sizes from 2x2 up to 11x14. Please, follow the thumbnails below to view large images and a full selection of sizes for each tile! 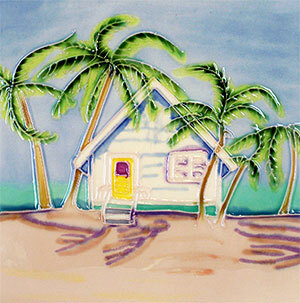 Give Our Nautical and Beach Tiles Permission To Come Aboard For A Seaworthy Abode! "By the sea, by the sea, by the beautiful sea. You and me, you and me, oh how happy we'll be." So went the sprightly lyrics of a hit tune from the 1914 musical, For Me And My Gal and we've been humming along ever since. Our relationship to the ocean brims with romance, daring the waves, summer family fun and the reflective moods of great poets. Whether you commune with the sea from under a striped umbrella on the sand, hit the surf with a board or embark for the horizon on your boat, it's the tang of salt air, the unobstructed sun and the endless expanse of jewel-toned water all of us crave when we come to the shore. 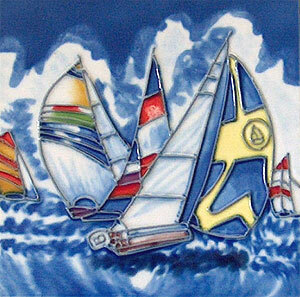 Our tiles can bring that nautical sense to any room of your home, any time of the year, in any part of the country. Consider brightening a kitchen with our ever-growing selection of handpainted beach tiles, featuring scenes of everything from flip flop sandals to comfortable Adirondack chairs, strewn gaily on the golden sand. While you are peeling potatoes or doing the dishes, your mind can take a mini-vacation just by looking at your backsplash, counter top or a special focal mosaic created from these painterly tiles. Nautical-themed decorative tiles are a natural in the kitchen. They speak of cleanly spaces, fresh air and sunlight - virtues we'd all like our kitchens to have. Available in multiple sizes, our beach tiles can be grouted into a variety of projects, or you can use them as very pretty coasters to protect your tabletop from stains. 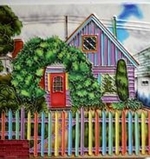 Anywhere you incorporate these tiles into your home, you will be adding color and vibrant life. Whether you are lucky enough to get to go sailing on a regular basis, or you've always planned for the day you'll take an ocean voyage, building a boat tile themed mosaic into a fireplace, tabletop or room of your home keeps your happiest nautical dreams close at hand at all times. Choose from sailboats, fishing boats, catamarans - even surf boards if that's your chosen mode of ocean transportation! If you've got a bumper sticker on your car that reads, "I'd rather be sailing," boat tiles are a natural when it comes to your home decor. Boat tiles are a wonderful nod to mankind's incredibly long history of sailing. From the reed ships and junks of Africa and Asia, to island canoes and the caravels of the Renaissance, water was man's first highway - a tradition worth celebrating! Wherever you place these tiles, you will be incorporating a tasteful, nautical element. Consider grouting them into a nursery room mosaic if you're not a fond of the fluffy, plastic decor typically associated with children's rooms these days. Show your children the wonders of the sea to spark their curiosity and promote an imaginative 'bon voyage' through life! Turn your bathroom into a serene island spa with the iconic beauty of our palm tree tiles. Your tiled shower becomes a tropical grotto and your backsplash, an artistic scene from paradise with these colorful, hand-painted tiles. We offer both folk-art and realistic botanical depictions of palms and palmettos by the sea in the moonlight, on clear blue days, or bathed in the glowing light of sunset. If life feels hectic and you're longing for nothing so much as a gently swaying hammock under the palms, our tiles capture your heart's dream. In addition to being a gorgeous choice for tiling a bathroom, a palm tree tile motif can really express your tastes and personality in an office or den. So many of us work on computers these days. It's important to rest your eyes every 10 minutes or so, and what better to rest them on than a mosaic of dreamy palms? Re-energize your mind every time you behold this classic symbol of tropical beauty. It's the next best thing to taking a vacation! See photos of one of our customers' nautical tile installation projects. Looking for dolphins, whales, sea shells and more? Visit our Sea Tiles page. Looking for sea turtles? 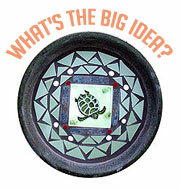 Visit our Turtle Tiles page. Looking for lighthouses? Visit our Lighthouse Tiles page. Don't see the Beach or Nautical Tile you're looking for?